While this photo might demand a little of your imagination to see the client’s water feature and tropical garden blooming out around their gazebo, what you can see right here and now, is the quality of the Outside Concepts Perth construction. Built as the centre-piece for an intended tropical oasis, this gazebo in the suburb of High Wycombe would compliment everyone’s house and garden. Differing from the traditional octagonal gazebo, it has been built in a contemporary rectangular shape with a hip roof and features treated pine framing to stave off marauding termites. 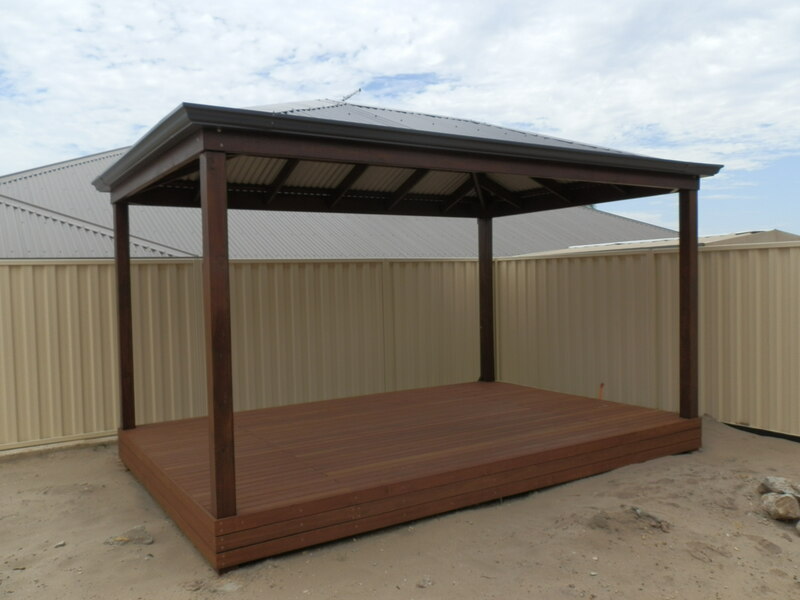 This has been tastefully stained with a Jarrah tinted timber stain giving a deep, rich brown colour while providing maximum protection of the timber. The Kapur timber deck is raised above the ground and skirted, or boxed in to give a sophisticated finish to the gazebo. The neatly hipped roof sits snuggly atop the structure – perfectly proportioned in height and scale. So if you want a magnificent tropical garden complete with bubbling fish pond with palms and ferns call Outside Concepts. We can get you half way there by designing and building you the finest gazebo in town!